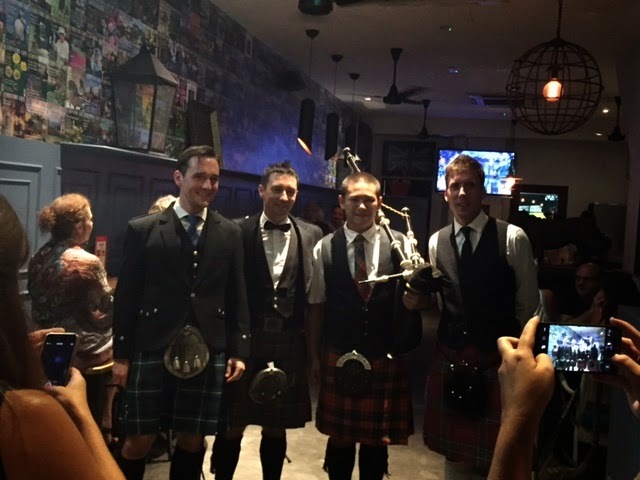 When we were asked along to Burns Night supper at The Trenchard Arms by Expat Adventures in Singapore, we simply couldn't refuse! A Burns Night supper is held annually (on or around 25 January) to celebrate the life and the poetry of a Scotsman by the name of Robert Burns. As this was our first Burns Night supper, the whole traditional affair was quite mesmerising. 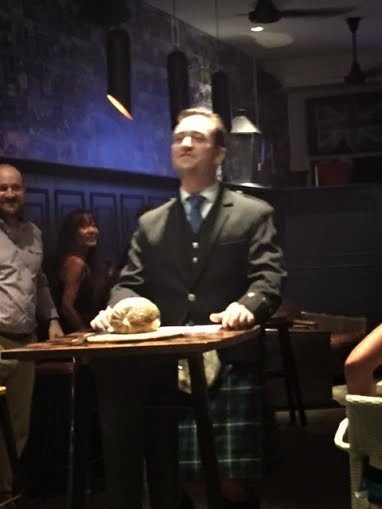 The tradition is that the Haggis has to be blessed before it is served. 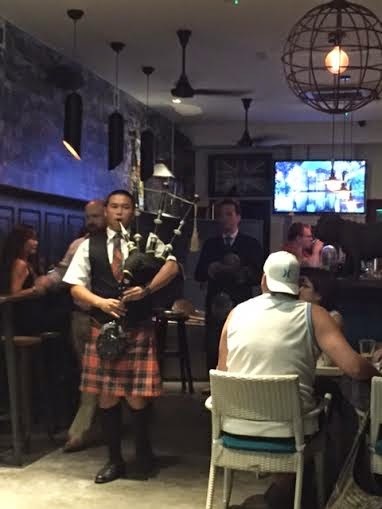 The Piper (in full regalia) played his Bagpipes all the way through the restaurant, through the kitchen and was followed by a Scotsman carrying the plate of Haggis. After the blessing of the Haggis and a wee 'dram' to toast (some Whisky), we were then served our meals. Haggis traditionally consists of Sheep's heart, liver and lungs, onion and a variety of spices encased in the Sheep's stomach. This is then simmered for approximately three hours. In modern times though, sausage casing is used. This is served with Neeps (Turnips) and Tatties (Potatoes). Ours was a "posh" version of the dish so the Haggis was served as "Medallions" and sat on a bed of Mashed Tatties (Potatoes), strips of Neeps (Turnips) and other Vegetables. It was plated very nicely. Being our first taste of Haggis, we were very impressed. It was like a nice peppery Lamb Meatloaf. The Pepper really added a nice heat to it. As everything was mashed up; and stuffed inside the casing, the Haggis simply crumbles away with each bite so that you can really enjoy the flavours. There wasn't anything unpleasant about our first experience. 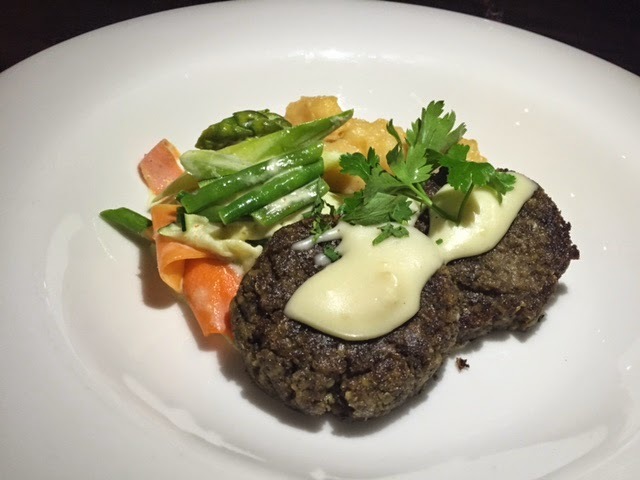 If you're not used to eating various parts of a Sheep, Haggis just might make you change your mind. It was quite tasty. In fact; we could've gone for another serving! 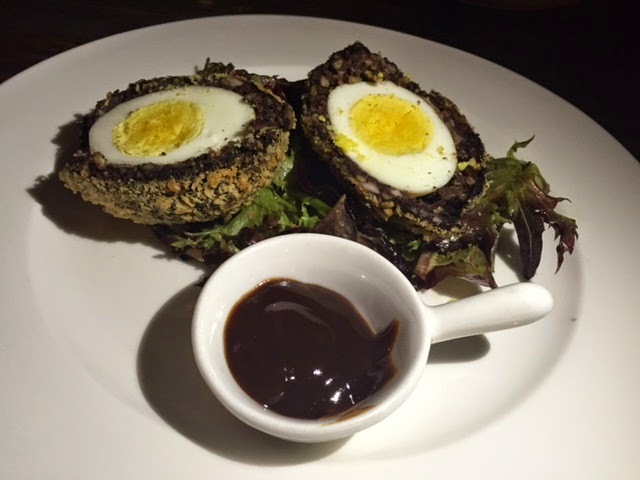 The Black Watch Scotch Egg was a soft boiled Egg encased in a Black Pudding and Pork Sausage mixture, which was then crumbed and fried. This was glorious. You can tell from the colour of the Egg Yolk that it wasn't overcooked to a horrible dull grey/green colour. The mixture of Black Pud and Pork Sausage was just right; perfect saltiness, with the Pork giving a hint of smokiness to it all. The fried crispy Bread Crumbs on the outside really made the Scotch Egg an adventure of the textures; as you bite in, you get crispy, chewy and then finally the softness of the Egg. It just all works so well together. With such a great experience; we began talking about how we needed to get to Scotland to experience a more rustic Haggis dish and also to taste the various ways it could be made. Perhaps this is something we need to add to the list of "To Do". 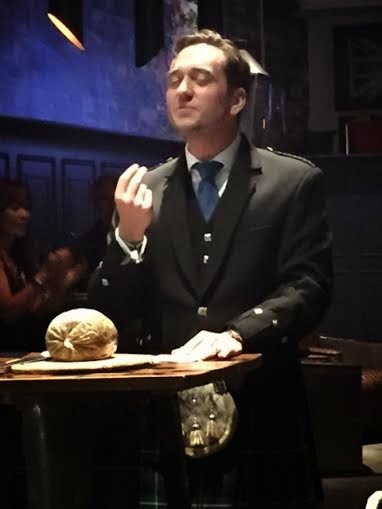 For those who are interested in what is said during the blessing of the Haggis; read on!